It’s a common scene in fiction: A person walks into a workshop or smithy. The room is dark, smoky, and lit mainly by a few faint lamps or tube lights, with red hues dancing about the walls from a forge. Now try to picture yourself working in a similar environment. In truth, most forges and workshops throughout history were either open-air or had the ability to open large doors or shutters for plenty of light. Your garage or workshop shouldn’t look like something out of an old movie. It needs good lighting so you can see those socket sizes or locate a screw that rolled under your tool chest. The following are some of the best garage lights out there for both residential and commercial work spaces. TIP: Be sure to read our simple life hack at the end of the article on how to easily convert a pull cord into a wall switch. 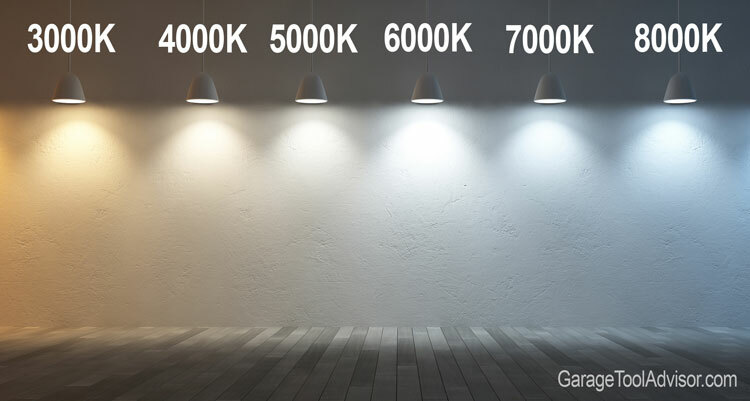 What Color Temperature (Kelvin) is Best for a Garage or Shop? There are plenty of lighting options out there, as well as different types of light fixture. We aim to bring you the best from this range, allowing you to choose the lighting that’s most compatible with your own needs. Of course, there are other garage lighting ideas for when you plan to use your garage for multiple functions, but when it comes to working on cars, repairing small appliances, woodworking, or just trying to see what’s in that overhead storage rack, these choices are tough to beat. 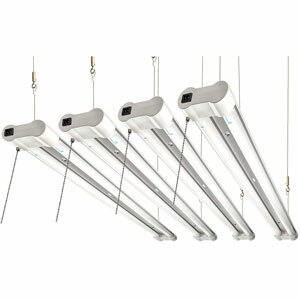 This 4-piece set of shop lights can make a huge difference in both visibility and your electric bill. The 3,700 lumen output in each 4-foot light is equivalent to a 64w fluorescent bulb and has a color temperature of 5,000 Kelvin (commonly known as “daylight white light”). Each of the four lamps has a built-in outlet, allowing you to chain the lights together and run all off of a single pull string – or mount them separately for those times when you want to illuminate just one part of your garage or shop at a time. As with any lighting option here, plugging the light into an outlet which is controlled by a wall switch is usually the best option. This is one of the most popular lights out there for industrial, commercial, and home use. Its ability to be mounted directly to your garage ceiling or suspended give more options to match ceiling height concerns. Last (but certainly not least), the housings are made of lightweight but durable composite aluminum for a long-lasting lighting solution and are backed by a 5-year warranty. You’re not going to find many sites (or owners) who don’t highly recommend this set. They’re incredibly bright and the five-foot power cords mean you can chain them together over long distances. Also, unlike fluorescents, these lights come on immediately (even in winter) and are less prone to flickering. Despite being one of the most popular shop lights on the market, there seems to have been a few issues with bulbs burning out after only a few months. These complaints are pretty rare, and there’s some suggestion that it could be a wiring defect but the manufacturer is usually quick to resolve. Another possible issue is that these lights make any space so inviting that your family may attempt to turn your workshop into another living space. You have been warned! If you’ve been a long-time reader, then you’ll know how much we love this four-foot light. It puts out a wonderfully bright 2,200 lumens with a color temperature rating of 6500K (AKA “super bright white) while requiring up to 65 percent less energy than an equivalent fluorescent light. 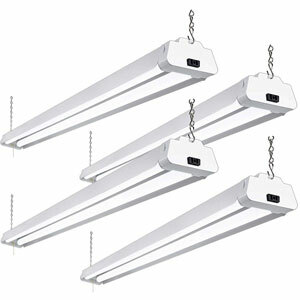 Unlike most lighting fixtures, these are amazingly easy to install on your garage ceiling, above your workbench, basement, storage area, under desk hoods, and in a variety of other spaces, thanks to a plug-and-play design. These lights also have the ability to be connected seamlessly or via connector cords to allow for a range of chain lighting options, and the lights include built-in power switches. But perhaps the best feature isn’t the light weight or brightness, it’s the price. For the cost of a family dinner at a good restaurant, you can bring home a six-pack of these wonders. We’re willing to bet you’ll be using every one of them throughout your home, too! Because of their low profile, you can even install on your basement ceiling where recessed lights are not an option. The plug-and-play feature is a real time-saver, as the lights weigh very little and use simple mounting brackets (so no stud hunting!). Barrina is very good about the quality of their products and will immediately replace a bracket if you damage it during installation. There’s no flicker or excess heat output as is common in many other lights (including some LEDs), making them epilepsy-safe and great for photographing your projects. Some consumers have had RFI (radio frequency interference) issues, although this is not a widely reported issue and may be restricted to affecting specific devices. While plenty bright, if your garage or shop ceiling is higher than the norm, you may want to go with a different light with a higher lumen output. This twin LED light can save up to 62 percent of the cost from an existing twin fluorescent light while still having a 45,000 hour life expectancy. The color temperature is a slightly cooler 4,000k (no blueish tint) and puts out an incredible 4,000 lumens, making it one of the brightest shop lights we’ve ever recommended. The light features a pull chain and outlet to facilitate chaining additional lights. Installation is performed through a plug-and-play feature and the rugged steel housing means this light can take a few good knocks that would dent aluminum frames. And if these features aren’t enough, these lights have a DLC qualification for maximum potential rebate and are covered by a 5-year unlimited warranty. The easy mounting and bright light make this model a real winner with most buyers. Hyperikon really stands by its products, and even the smallest complaint gets addressed (including the brightness – Hyperikon has even exchanged lower-lumen models with consumers who had trouble with this model’s output). The steel casing and option to mount flush or on steel cables only adds to the versatility of these lights. While great for an area with higher clearance, the amount of light this bad boy puts out may be too harsh for low ceilings. A few people have also had issues with the wrong mounting hardware being included. Thankfully, the latter problem is remedied with little or no hassle by Hyperikon’s customer service. Also, be warned: Saying these are bright is like saying a volcano puts out heat. You could kill gremlins from a mile away at 3AM if you link a dozen of these together, so be sure to install them one at a time and test the brightness to avoid making it too bright. North Carolina based Striker Concepts introduces something completely different – a deformable LED light that might as well have come from NASA. Resembling a solar array, the core of this light screws into a standard socket. The three arrays can be folded up to 90 degrees, allowing them to sit flush with the core or parallel with the ceiling and aim light where it’s needed most. The design isn’t just meant to look cool, however, as the premium aluminum alloy frame provides heat dissipation and better resistance to corrosion. 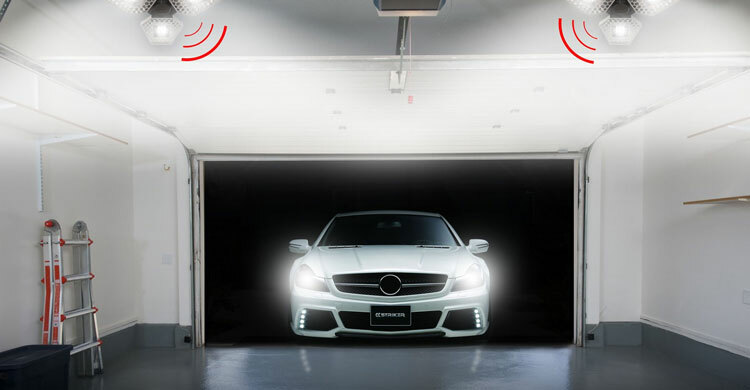 This is possibly the top LED light for a garage that has multiple functions. Its simple screw-in design means zero fuss when installing. The Striker Concepts light provides 3000 lumens of bright white light (5400K temp), and owners enjoy the ability to adjust the three panels to either focus on specific areas or soften the overall glow. The price is a bit higher compared to other 3 panel style lights but you’re getting a higher quality product from a USA based company. Some users have had issues thinking the light never turns off. Because the motion sensor is so sensitive it may appear this way but in reality, the light is off when nobody’s around. Fortunately, the motion sensing feature can easily be disabled. These twin LED shop lights make one of the best budget garage lighting options out there. Simply pull the chain and your workspace will be filled with a bright 4,800 lumens of light with a “daytime white” color temperature of 5,000k. The plug-and-play design allows you to hang or directly mount the fixture, which has an outlet to allow for light chaining. With a 5-year warranty and cETLus (Edison Testing Laboratories) certification, these lights will provide years of quality service. Despite their low price, these lights are built to last and are used everywhere from home workshops to industrial warehouses. Installation is incredibly easy, and the amount of light is perfect for most medium-sized home workshops or garages. One of the big pitfalls of having lighting shipped is the risk of damage. Several users have received these lights with damage to the frame and sometimes the light itself. In a few cases, they have also lacked the mounting hardware due to packaging errors. Another light with a somewhat alien appeal, this heavy duty warehouse light is packed with features you wouldn’t immediately expect. A preinstalled ring and 2.6 foot heavy duty rope make mounting both easy and safe. 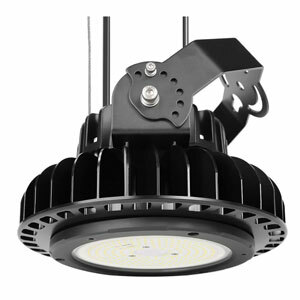 The Meanwell LED driver provides stable lighting at up to 75 percent less cost than halogen lamps, while a 180 degree swivel arc allows the light to be focused on a specific area. 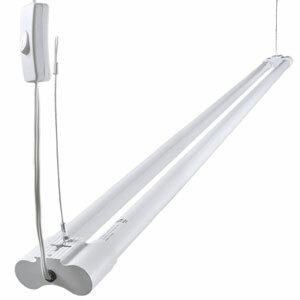 This super-bright light produces 19,500 lumens and includes a cord for use with dimming switches. Unlike many other lights on this list, Adiding has built their lights to take heavy abuse. They put out far less heat than a regular bulb, and the amount is further managed by heat dissipation fins. Due to the amount of light and ability to swivel, these also make great spotlights. In addition, the light is IP65 rated which means it’s protected from rain or low water pressure so it can be mounted outside. The only real downside is that the unit is self-contained, meaning you will have to replace the whole thing when the LEDs burn out. 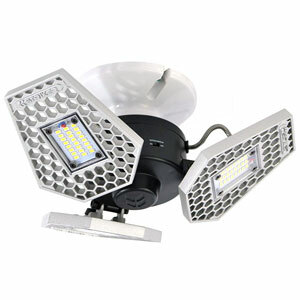 This is not intended for your typical residential garage but if you have a commercial shop, riding arena, warehouse, or high bay garage, you can’t beat the quality and light output of this heavy duty LED light. Rounding out our list of top quality lighting is a four foot shop light that’s perfect for working on cars or other situations where a slightly softer light is preferred. The 3,600 lumens provide plenty of visibility, while burning on a color temperature of 4000K making it the “softest” light on our list for less harshness in rooms with a lot of reflective surfaces. Physical temperature is also lower on these shatterproof, frosted LED bulbs, and a strong thermoplastic housing adds both durability and low temperature buildup. 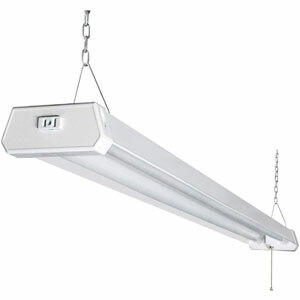 As with many shop and utility lights on our list, this light can be surface mounted or suspended for optimal placement using a plug-and-play design with in-line on/off switch. Adding comfort to quality, these lights are seizure-friendly and come with a 5-year hassle-free warranty. This light puts out just the right amount of light for a variety of consumer needs. Owners have used them in two-bay garages, in grow rooms, and in their workshops with equal satisfaction. The lack of a shield adds to your room’s brightness with certain types of ceiling material, and makes cleaning easier. While durable, this light isn’t completely break-proof. Several consumers have had the inner portions of the fixture crack or break, although the outer shell remains fine. In most cases, the inner damage doesn’t prevent the light from working. Many have also complained that the mounting brackets are brittle and warn that they may break during installation. Overall, it’s a good cheap LED light. There are quite a few factors that go into picking an ideal set of lights for your garage or workshop. You’ll encounter all sorts of stats (such as lumens and color temperature ratings), as well as a wide range of types and sizes. Here are a few common sticking points that will help you pick the best garage lighting for your needs. There are a wide variety of bulb types out there these days, a trend which seemed to explode after halogen bulbs became popular in European cars. 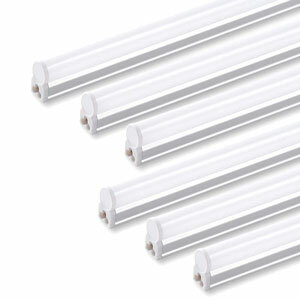 But two particular types – LED and fluorescent – are leading the competition. However, LED tends to be the best light bulb type of the bunch, hands down. For example, LED bulbs use a fraction of the power, saving on your energy bills. They also often have a longer lifespan and tend to be more durable without putting out less light. You can leave an LED light on for a week or more without it becoming too hot to touch. As a final note, they are more environmentally friendly and easier to recycle than fluorescent bulbs. Lumens are the metric equivalent of foot-candles, and you’ll find the measurement on almost every light source these days. If you already know your need in foot-candles, you can divide that number by .0929 to get the lumen (per meter) equivalent. A good general rule of thumb for ceiling-mounted lights is 20 lumens per square foot. Thus a regular 250 square foot living space requires approximately 5,000 lumens to be properly lit by a ceiling light. For a workshop of the same size, you may wish to make this 5,500 to 6,000 lumens minimum for a brighter space, but will want to avoid going over 8,000 lumens directly over a workspace. Color temperature is an important consideration when choosing lighting. This measurement doesn’t reflect the bulb’s own temperature but instead affects the tint and types of light waves the bulb puts out. As a general rule, you’ll want a range of 4000K to 7000K. This range most closely emulates natural light and provides the widest range of color emission if you were to hold a prism up to it. We would be amiss if we didn’t address a common complaint regarding the use of pull cords in a crowded workshop. Sometimes it’s more a matter of accessibility than cord length (which is easy to add on to). Luckily, it only takes a minute and a few dollars to remedy this problem. There are quite a few light socket adapters out there on the market (here’s a good one), with prices rarely exceeding $10. These can convert your existing garage light socket into one or more power outlets (with or without grounding). Simply screw the adapter into your old light socket, plug in your new shop light, and pull the cord to turn it on. That’s it! Now your light can be turned on and off from the wall switch.